Calcium is such an important part of keeping our bodies strong and healthy. For long-term storage, it is vitally important to store good sources of calcium. The great thing about calcium is that, unlike vitamins, its potency doesn’t reduce over time. It stays intact in the foods that contain it. In this section, we also offer eggs! A MUST if you are doing any kind of baking! Whole egg powder is easy to use—works great! #10 can holds approximately 100 eggs. 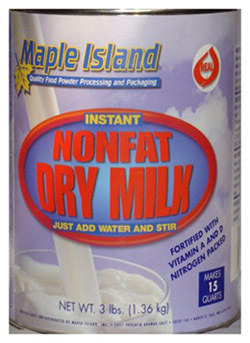 - It is instant non-fat milk. - There are 3 lbs per #10 can, which makes about 4 gallons of milk. - There are 6 cans per case. - Also available is a 50-lb bag. It makes 60 gallons of milk. This bag is a great deal if you can use it in your baking within a year or two! It is preferable to store milk in the cans as it will last up to 20 years or more. The advantage of buying this company's cans over canning your own (besides avoiding the mess) is that the company nitrogen-flushes its cans for extra storability. Is this as good as Morning Moo? Good question! Morning Moo is not milk! It is not even considered a dairy product. Morning Moo may taste good, but it is because it is whey mixed with sugar and preservatives! (Sorry to those of you who didn't know!) What we are getting is REAL milk. Yeah! But does it taste good? It tastes great! It has a much more robust flavor than does store-bought skim milk. What are the ingredients? Milk! Straight milk fortified with Vitamins A and D! What if I don't like "nonfat" milk; can I get whole milk? We are in the process of bringing in a whole-milk powder that, when canned with nitrogen flush, will also have a very long shelf life. Is it from cows that are not fed hormones? The company does not certify that. The milk comes from many different dairies. 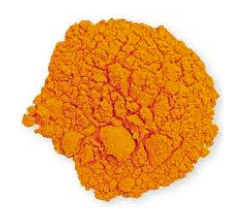 Unlike some other cheese powders, this has no fillers—it is straight, dehydrated cheddar cheese and is really yummy! I use this in my kitchen as it is cheaper and easier than grating tons of cheese for soups, etc. I still grate cheese for pizza, but in a recipe where the cheese is going to be melted—this is ideal! We offer a wide variety of other dairy powders such as buttermilk powder, butter powder, sour cream powder, etc. These are ideal for make-ahead mixes. If you want to make a homemade pancake mix or cake mix, for instance, or store your own favorite recipe of buttermilk ranch dressing in an easy-to-reconstitute powder—this would be GREAT! This is such a great product! Shelf-stable milk comes in 8-oz (1/2 pint) or 32-oz (quart) cartons, in cases of 27 and 12 respectively. It is stamped with a "best by" date of 1 year after manufacturing—but many of you have told me that you've tried the milk at 6 years and the whipping cream at 4 years beyond the "best by" date and it was still perfect!—and it tastes just like milk is supposed to taste. We've brought in whole milk, 2%, 1%, and skim, as well as a variety of great flavors like, strawberry, chocolate, vanilla, orange and yes, the kid's very favorite, rootbeer! Additionally, we have whipping cream. Its shelf life is set at 9 months, but again, if kept cool it should last longer than that. Many of you who have traveled around the world will recognize that this is the way that most countries package milk. It requires NO REFRIGERATION! These milk products are ideal for camping, family reunions, school lunches, or just a quick snack. You'll really be excited at how convenient—and fun—they are! REAL Butter and Cheese! NOT POWDERED! 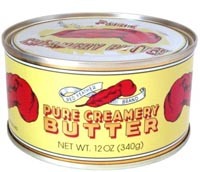 The Red Feather Butter tastes like real butter. The ingredients are pasteurized cream and salt! Some tell me that it takes them back to their dairy farm upbringings—here's the reason why: This butter is from New Zealand, where the cattle are range fed (there are no pesticides in these pastures!) and hormone free. It's an amazing product! 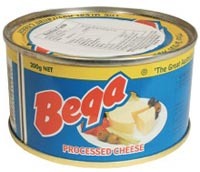 This Bega Cheese is actually a cheddar cheese recipe. It is kept from aging in the can by a *"process" that therefore requires it to be called "Processed Cheese"! It is white and hard and requires that you open the top and bottom of the can then push the cheese through. It will grate and slice like real cheese. It is a very cool product! *These come in cans that have been canned in a zero-oxygen atmosphere in an atmospheric pressure canner. Therefore it will last on your shelf for 25-30 years! These products are imported from New Zealand and Australia—both USDA-approved countries—by companies that are FDA-approved. Clarified Butter or Ghee: This one requires a little education—at least it did for me! "Ghee is ideal for sautéing, braising, pan-frying and deep-frying whenever you want a rich butter-infused flavor. It is packed with flavor, and often 1 tablespoon of ghee will work just as well as four tablespoons of any other cooking oil. Ghee allows for easy cooking with the highest quality and amazing taste while enriching the flavors of both sweet and savory foods. It is the healthy, all-natural, salt-free, lactose-free alternative to hydrogenated oils that clog arteries. "Ghee can be used in any type of cooking. It has an excellent aroma. Having a high burning point, it won't burn or smoke during sautéing or frying food. It can be used during barbecuing or in baking, replacing butter and oils. Because of its delicious flavor it can also be used as a syrup or sauce. 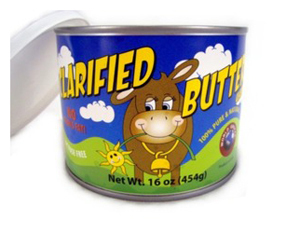 "The Clarified Butter / Ghee is made from pure butter in the U.S. under the strictest quality-control standards. Ghee is the most common cooking medium used worldwide instead of traditional cooking oils like Olive or Vegetable Oil, and it is actually considered to be healthier than most oils—because you use so much less!" Here's a tip: Since many of you are starting to use coconut oil, this is a great way to add a bit of butter flavor back to certain baked goods when you've substituted coconut oil for butter. Since the flavor is so powerful, a little Ghee can go a long way in giving you that comforting buttery flavor while keeping your baked goods healthy!